For a number of years this was the website for the Washburne Café. In 2016 the original owners were bought out. See the news article below. The domain registration to the restaurant's website expired and the new owner of the domain decided to keep the site about the cafe in case people inadvertantly ended up here while looking for the Washburne Café. After 5 years of owning and operating the cafe, my husband and business partner Jeff and I have decided to sell the cafe. Today, September 29th is our last day. Tomorrow, Derek and Mindy Weber and Charlie Hester will take over as owners and operators. They will be closed for a couple weeks to make some changes inside. I want to thank all my loyal customers and hope you will continue to support the Cafe. We feel good about handing over the business to Derek, Mindy and Charlie and wish them well. They will honor your gift cards and coffee cards. Driving down Springfield’s Main Street, visitors pass historic buildings that were once the heart of the town. Although the city spread out, the street maintains a nostalgic feel. Among its modern restaurants, fabric stores and coffee shops sits the Washburne Cafe. The Washburne’s yellow brickwork stands out among the rest of the quaint street. An archway interrupts the golden facade, leading to the front entrance. A sheet of printer paper, which reads “I like you” in a child’s handwriting, hangs on the left door. “We really wanted to be a community space where people could meet,” cafe co-owner Charlie Hester said. After 11 years in the Portland coffee business, Hester — a Springfield native — wanted to open his own coffee shop. “It felt really nice to come home,” he said. He partnered with two of his high school friends, Derek and Mindy Weber, to open their own cafe. Hester was somewhat nervous to go into business with such good friends, but it has been easier than expected. “I was worried we’d argue more, but it’s been pretty easy. I got to design the bar and Derek gets his kitchen,” said Hester. Hester and the Webers bought the Washburne from previous management last September. After a month of renovations, the cafe reopened on Oct. 24, 2016. To maintain the authentic Springfield atmosphere, the owners focused their interior design on the building’s original 1911 brick walls and hardwood floors. Inside the cafe’s doors, one can find a combination of a modern, tasteful aesthetic with undertones of Springfield’s history. Exposed brick, crisp white walls and minimalist design encompass the cafe. Community members can enjoy a cup of coffee at a variety of benches, bars and couches. The combination of vintage decorations, clean lines and an abundance of greenery create a comfortable space for the Springfield community. The single brick wall displays a variety of merchandise and a menu composed of marquee lettering. “It’s very hipster and minimalistic — the drink menu, too,” cafe regular Jessica Rez said. “Honestly, I just really like it here.” The food menu contains variations of classic breakfast and lunch foods, like eggs and toast, sandwiches, oatmeal and pastries. The Washburne’s commitment to selling local goods helps the cafe embody its community. The merchandise wall features goods from local vendors and artists, and the coffee is from the closest producer the owners could find without sacrificing taste. Derek Weber uses bread from the Hideaway Bakery in South Eugene and dairy products from Umpqua Dairy to create items for the Washburne menu. The Washburne’s owners try to use local vendors because they believe promoting other people’s passions is important. “We try to keep it as Springfield as possible. It’s all about supporting other people,” Hester said. In the future, Hester and Weber would like to start roasting their own coffee and selling their own bread. Until then, they are happy with where they are. “Growing up I couldn’t wait to leave, but when I came back I found people who were so fiercely Springfield,” said Hester. He feels more connected to the people here and hopes the Washburne connects its patrons to the wider community. With a deep appreciation for home, Hester and the Webers don’t see the Washburne going anywhere. 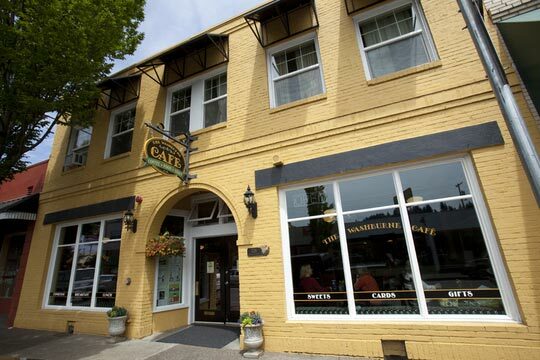 The Washburne Cafe, located in the historic Springfield Armory building, is the spot for homecooked food and a relaxing atmosphere in downtown Springfield Oregon. Serving breakfast, lunch, interesting salads, homemade soups, fresh baked coffee cake, pastries, cookies and a wide variety of coffee drinks, the Washburne Cafe is the perfect spot to eat and enjoy your day. The Café is open for breakfast, lunch and private parties in the evening. Our eclectic menu offers something for everyone. Our breakfast offerings include ~ steel cut oats, omelets, to our popular breakfast bowl made up of eggs, potatoes, bacon or ham to bagels with cream cheese. Lunches feature homemade soups, our popular Panini sandwiches, wraps and daily specials. We also feature a full espresso bar and a variety of homemade baked goods to satisfy your sweet tooth. The Washburne Café also has free WiFi, so bring your laptop. The Washburne Café also has a great selection of greeting cards, candles and other gift items available. Schedule your next off-site meeting in our private meeting room. There is no charge for using the space and we are happy to do a special menu to accommodate your group. The Washburne is also available "after hours" during the week for your special events. The Washburne Café is owned and operated by Marilou Heriot and is located in a historic building that housed the former Springfield Armory. The business incorporates the exposed brick wall, 100-year-old floors to create a cozy atmosphere with a urban vibe. Available for large groups - call ahead for details. Breakfast is served from 7:30am-11:00am during the week & 8:00am-2:00pm on the weekends. This was one of my favorite cafes. Sadly, when I stopped in one day for lunch, I found that everything had changed. Yes, I knew they were under new management, but I was hoping for lunch. They still have excellent coffee, but their food offerings are limited. Please give them time to find their niche! What I particularly enjoyed though, was the open setting and that they were selling handmade products from people within the community. That in itself is really cool. I will return on my next trip through that area, and I wish the new owner(s) well. Delicious breakfast, especially the Greek omelette. My family and I stopped here twice as we passed through Eugene/Springfield on I-5, once for breakfast and the second time for lunch. We were delighted each time. The physical space is charming; an older building, with exposed brick walls and hard wood floors. The ambiance was delightful; large street-side windows providing lots of natural light and art by a local artist on one of the walls. And the food was wonderful. For breakfast, my daughter and I shared a Greek omelette -- it's been a long time since I enjoyed an omelette so much. The spinach and onions were sauted perfectly before being added to the omelette. My other daughter had the oatmeal, and my wife had the granola, fruit, and yogurt. Both raved about their breakfasts. A week later, on our return trip through Springfield, we stopped for lunch. Again we were pleased. I enjoyed my summer salad (with fresh, mixed greens, candied walnuts, and gorgonzola cheese), and my wife and daughter happily shared the Mediterranean Panini and the special soup. The Cafe uses fresh, high-quality ingredients, and prepares interesting omelettes and sandwiches. I should add that the proprietor was friendly and welcoming. We highly recommend, especially if you're looking for an interesting breakfast/lunch stop if you are passing through on I-5. I really love the new Washburne. Under the previous owners, the Washburne Cafe had a kind of dated, ladies-who-lunch feel. The food was okay, but considering that we live nearby and only went twice over the course of a year or so, clearly nothing compelling. Now the Washburne has a fresh, clean look, the coffee is great, the service is friendly, and they have a fantastic, if limited, breakfast menu. This weekend my husband had the biscuit breakfast sandwich with pork belly and egg. For the size and quality, it would have been a bargain at twice the price--okay, maybe 1.33 times the price--it was $9. I had the green chile tostada with pulled pork and fried egg. Also super delicious, and though it looked, compared to my husband's sandwich, like a small portion, it turned out to be more than I could eat. RATED New owners have changed this place to the best coffee house in the area! Good food menu and very good coffee. Plus an interior that would fit in, in Seattle, Portland or San Francisco. POSITIVE Great lil spot to meet up with friends and catch up over a great coffee or latte, good sandwiches and very good breakfast items. Fresh and flavorful. The service wasn't that great, the gal waiting on us didn't act like she wanted to be there and never once smiled or said thank you or enjoy or anything. We all have our bad days I guess. Lunch. Ate there last week. Had the soup and sandwich - Delish Love the atmosphere and the curry or lobster soup are out of this world. Washburne Chicken Salad. A wonderful blend of chicken breast, celery, pecans, dried cranberries and green onions tossed with a honey mustard aioli ~ all on a bed of spring greens. POSITIVE The Washburne Cafe Brightens Up Downtown Springfield. I've eaten at the Washburne Cafe nearly every week since it opened over a year ago. I keep coming back for the flavorful coffee, interesting soups, and hearty breakfasts (the Washburne bowl -- red potatoes covered with eggs scrambled with bacon or ham, topped with cheese and green onions, plus a side of salsa -- is my favorite). They also have a great choice of pastries if you enjoy sweet goodies with your coffee (I often buy their oatmeal raisin cookies to take out home for a sweet treat). The service at the Washburne is friendly (I'm always greeted by my first name when I enter and get a "good-bye" when I leave), the atmosphere is a mix of historic Springfield (antiques, old photos) with today's art scene (a wall of artwork by local artists rotated each month). POSITIVE Awesome Paninis. My wife went a few weeks ago and said we both needed to go. We went for lunch today. Awesome paninis and the Sumatran coffee from Cascade Estates was awesome (I'm a coffee snob). Great place in the historic Washburne District of Springfield. POSITIVE Nice place, good sandwiches, great building. The Hungarian Mushroom soup and Thin Mint Latte.. Both items were absolutely delicious. POSITIVE A Winner!. Saw the Washburne Cafe's sign go up a few weeks ago on Main St. in downtown Springfield and made my first visit yesterday - what a treat! Located in an old building the owners have refurbished beautifully, the Washburne is open and airy, modern & sophisticated yet friendly. I appreciated the comfy seating & nice touches like glowing original wood floors and casual little vases of fresh flowers on the tables. Service is limited to breakfast & lunch w/a tempting selection of "snack" pastries and a nice array of coffees, teas, and Italian sodas. Small but interesting lunch menu has a good selection of paninis & sandwiches priced between $5.95 and $6.95. Rotating daily selection of "made from scratch" soups at $2.95 for a cup and $3.95 for a bowl - heck of a deal. Tried their mushroom soup and would venture to say it was hands down the best I've ever had (take that Marche!). I'll be back very soon to try their lobster bisque. Can also vouch for their blueberry scones - fresh baked & tender - with plenty of berries. Located on Main St, just down from Econo Sales, with free on street parking and a few extra reserved spaces around the corner. Good value, good food, pleasant service & ambiance, the Washburne is a breath of fresh air! Did you know that coffee has been around since the thirteenth century? That's a long time to work on making the perfect cup of coffee. But we like to think we're pretty much there. We source our coffee beans from the local Eugene roaster, Cascade Estates Coffee. We use the Sumatra blend in our popular house coffee. The Sumatra beans are some of the most complex in the world and are highly prized due to the delightful smooth, rich, heavy body and low acidity. A delightful mixture of ground chocolate, cinnamon, vanilla bean and a hint of almond add this mixture to espresso and steamed milk and you have the Washburne Mocha. For individuals needing an extra kick! This is a cup of our House coffee with shots of espresso added on top. A candy bar in a cup ~ Espresso + Almond syrup + Chocolate together with steamed milk. A touch of summer in your cup. A candybar in a cup! Peanut butter, chocolate and coffee in a cup, what taste better than that? This is only available through the fall and into the first months of winter. This drink brings thoughts of fall and Thanksgiving to you by combining cinnamon, nutmeg, ginger and cloves with the right amount of pumpkin, it's like a slice of pie! The sweet, nutty flavor or both roasted and raw hazelnuts combined with espresso, this latte satisfies both salty and sweet cravings. Breakfast has long been considered the most important meal of the day. Make sure your day starts with the best! Come in for an omelet, scramble or heart-healthy oatmeal and fresh fruit. Omelets and Scrambles are served with Ciabatta toast and roasted red potatoes. Your choick of Sausage or ham, eggs & cheddar cheese served inside your choice of a toasted bagel or a Ciabatta bun. We have a variety of sweet treats that are made for you by The Washburne staff. Chocolate Chocolate Chip, Blueberry, Tropical Fruit, Morning Glory, Apple Cinnamon, Pumpkin Spice, Raisin Bran, Raspberry, Gingered Orange, Cinnamon among others. Muffins are 'bakers choice', not all flavors will be available every day. Coffee Cake is a daily 'bakers choice'. Options could include Raspberry in a red wine reduction, Pecan Cinnamon, Sour Cream, Blueberries in a sparkling wine sauce, or a fan favorite, Tropical Fruit. Do you like coconut? So do we! Chocolate and toasted coconut goodness abound in this treat. All of our soups are made fresh, every morning. The soup menu is du jour. (Meaning, we don’t have a set daily soup.) Our soup selection depends on seasonal ingredients and the whim of Marilou. Check out our soup of the day on our Facebook page or give us a call! Or take a culinary chance and let us surprise you! You won’t regret it. Check our Facebook page for the soup of the day. You can also sign up for our monthly newsletter which includes a list of the soups that will be offered each month. Who doesn't love a good sandwich? Did you know people were making sandwiches way before they were even called that? Back in the middle ages, it was just a handy way of containing meat while you travelled. Our Panini Sandwiches are made on fresh-baked focaccia bread. Our Panini's and Wraps are served with Kettle Chips. Or get a half sandwich or wrap and add a salad or cup of home made soup. Fresh, crisp and nutritious, the Washburne Cafe salads are a mix of fresh spring greens and in-season vegetables. Alone or alongside half a sandwich or cup of soup, your should treat yourself to a little bit of green! A delightful mixture of diced chicken breast, celery, dried canberries, pecans, green onions dressed with a honey mustard aioli, and served on a bed of spring greens. We have wine and beer available to enjoy by the glass. This Washington state wine offers the spicy and rich aromas of nutmeg, pear, pineapple and creamy butterscotch. A wonderful compliment to your breakfast! Made withorange juice & Segura Viudas sparkling wine.